Heininger - PortablePet Pet Partition - 3048 | Barrier for Dogs that Fits Most SUV's, Station Wagons & MiniVans | California Car Cover Co.
Space barrier keeps pets, suitcases and other cargo in a separate area at the back of vehicle. Fits most SUV's, station wagons and mini-vans. Width adjusts from 34" to 60", and height adjusts from 27" to 45"
The Heininger PortablePET Pet Partition is the safe way for pet owners to share drive time with their furry friends without compromising their attention to the road around them. With it pets are safely, yet comfortably confined to a spot in the back seat of your vehicle. Easy to install and adjustable from 34" to 60" in width and 27" to 45" in height, the PortablePET Pet Partition is nearly universal in application making it perfect for virtually any SUV, minivan or station wagon. More features include: easy installation, compatibility with medium to large sized dogs, also functions as a partition for hauling luggage. Love taking your dog with you on the road but hate having your pooch jump all over your lap while you're driving? The Pet Partition by PortablePET solves this problem by creating a barrier in the back seat which prevents man's best friend from causing an unintentional accident. In addition to keeping Fido in the back seat while you concentrate on the road, the slim but sturdy tubing construction of Pet Partition allows for full visibility out of the back window when in use. The Pet Partition works great with medium to large size dogs and is easy to assemble. The fully adjustable in both height and width, PortablePET Pet Partition works in almost every SUV, minivan or wagon, with width adjusts from 34" to 60" and the height adjusts from 27" to 45". What types of vehicles will the Pet Partition work with? 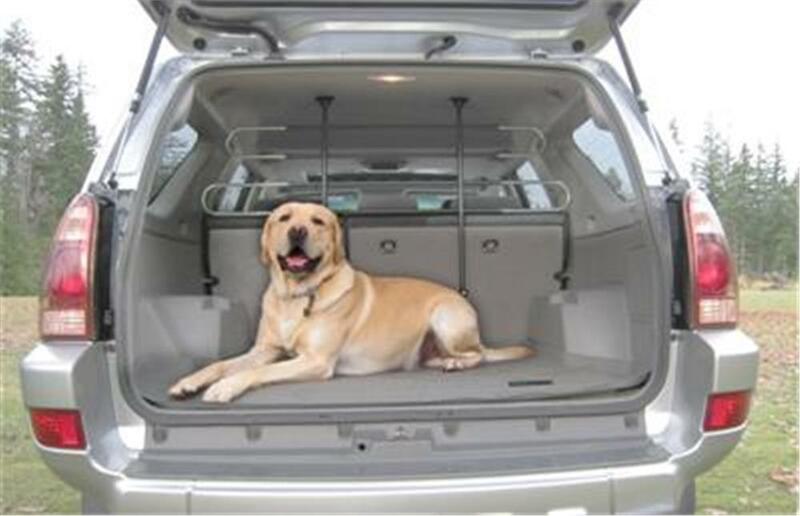 The Pet Partition is ideal for Crossovers, SUV’s, Mini-Vans and Station Wagons. What size dogs should we use this for? The Pet Partition is suitable for Medium to Large sized dogs. The Pet Partition seems loose, can I tighten I tighten it more? Yes. To fully secure the Pet Partition, hold the lower volcano shaped foot with one hand and turn the LOWER adjustment COUNTER-CLOCKWISE with the other hand. This will extend the lower bolt inside the tube and fully secure the Pet Partition. Do this to both lower adjustments for a tight fit.